42 cards later and 2 months down the road this project is still on track and moving. Which brought on today’s quote. 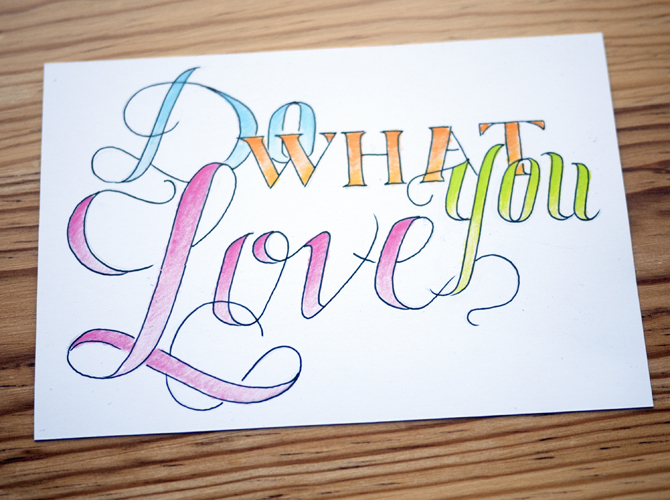 Find something that makes you happy and keeps your inspirations flowing… does wonders, I promise! Things to work on: The cards in my opinion have started to get a little bit more plain. They are still taking the same amount of time though. Drawing type is hard and still somewhat new to me. Goal: Get back to more detail and work on creating more themes and characters. Hopefully you will see more festive cards next month! Pretty obvious don’t you think? Today’s card is something I always try say to myself even on the good days. It’s always better to be positive, because usually good things come from it. I can’t make promises, but happy/positive people are always the best to interact with. 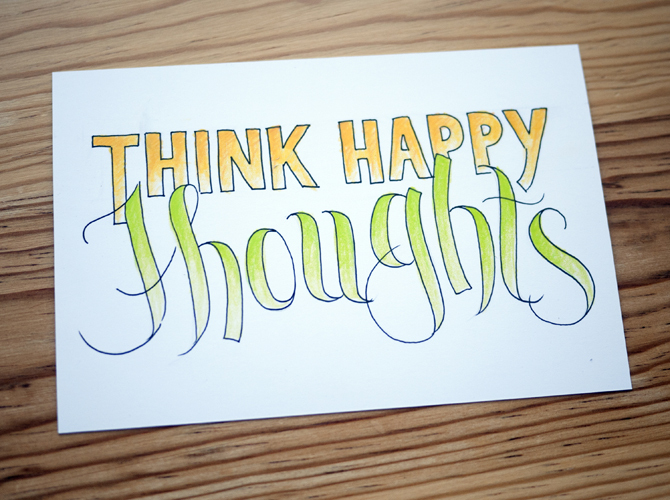 So… think happy thoughts and have a great day. It’s almost Friday which means weekend, relaxation and adventure! Mr. 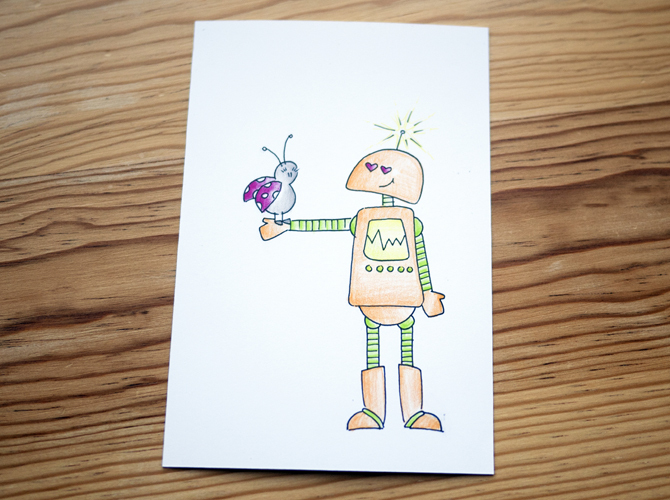 Robot and his Love Bug. Don’t ask me how I came up with this one… but, I will say it’s inspired by two lovely people. One of which has signed up for the Wandering Poste mailing list. They are very fun loving, slightly dorky, but awesome people. Anyways, just a little fun with a Robot and a lady bug. I am very happy with how it turned out, so they might just have to make another appearance down the road. 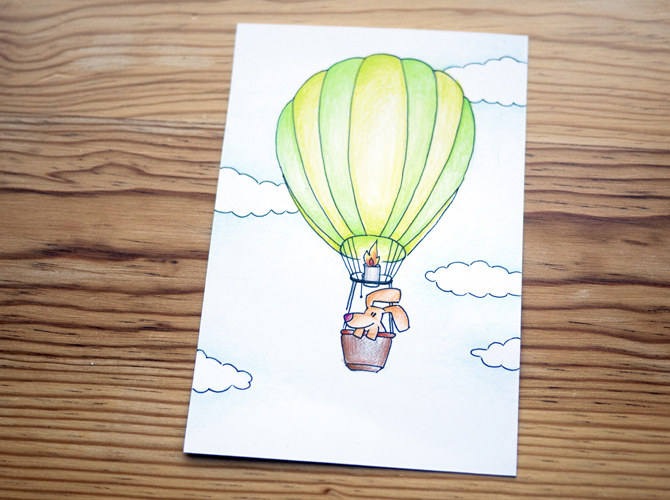 Today’s postcard is something about summer I really miss… hot air balloons! Growing up in Sonoma county throughout spring and summer on nice clear days you would always see multiple hot air balloons floating around. It always made me happy and is always something fun to spot. Now living in a mountain town you don’t see them much. Although I am not a huge fan of heights, I think a hot air balloon ride will have to be added to the bucket list. Mom had sent me a quote the other day. Well, I kept thinking about it all weekend, so it become today’s postcard. I really liked the quote, because it really makes you realize that your attitude and thoughts will become who you are. 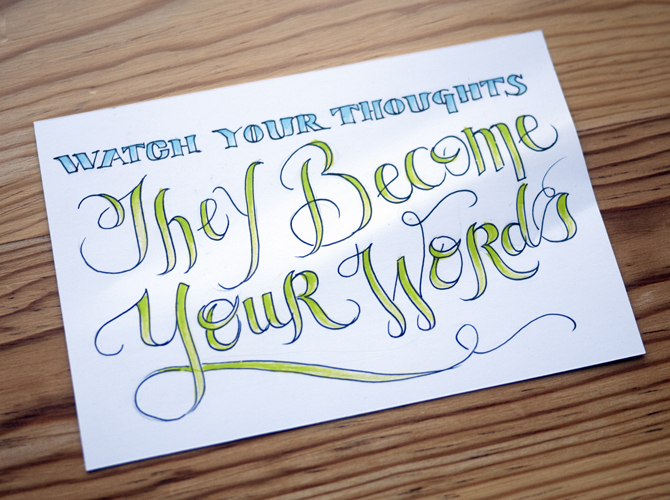 Negative thoughts will come out eventually if you aren’t careful… so the best thing to do is to be positive. Keep a smile on your face and think happy thoughts. Life is to short to be a grumpy and nobody likes a mean person either.